If one day you wake up and find the world overrun with zombies, what would you do? Well, getting to safety should be one of the top priorities. You will be right in the middle of such a situation in Dead Car Run, a new arcade game developed by the team at LOVEGAMES studio. Unlike most post-apocalyptic zombie shooters that have you running around a dangerous city on foot, this time you will be driving. The goal is to run over as many zombies as possible. Without a car, you stand no chance against the hordes of zombies that roam the streets. To make matters worse, the walking dead have set up ramps and all manner of road blocks to stop you from getting away. 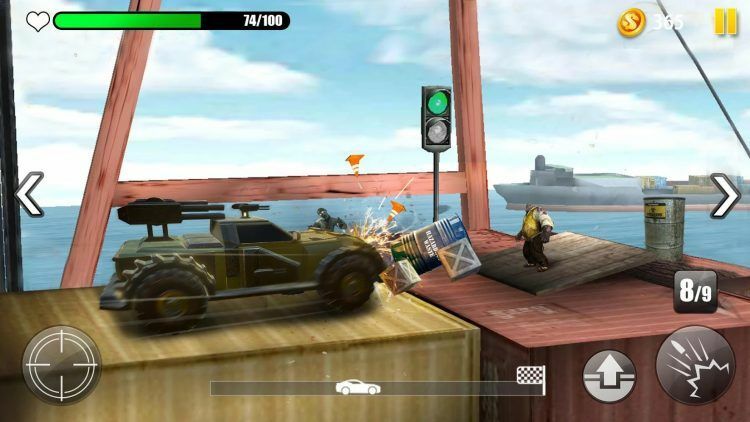 With such a premise, Dead Car Run on PC or mobile no doubt appeals to our basic fight-or-flight instinct in a fun way. The cars offered in this game provide you with plenty of nice options. You can drive an armored truck, van, jeep, tractor, or RV, just to name a few. Each car has a unique push bar bumper. This can range from a rotary thresher to a spiked bumper. The push bar bumpers not only fight through obstacles but also increase zombie killing ability. Whatever vehicle you desire, you have to unlock it. Completing a level earns you coins, which can buy new cars. However, most cars only become available for unlocking at certain levels. This means that you have to devote a bit of time into the game before you can get the best zombie crushing cars. Dead Car Run on PC strikes a good balance between cosmetics and performance when it comes to vehicle upgrades. If you just want to improve the way your vehicle looks, simply give it a new paint job. But, if survival is at the top of your mind, your cash rewards are best spent on performance upgrades. Upgrading the tires improves traction and makes driving uphill easier. You can upgrade the fuel tank volume to drive further or increase the machine gun’s ammunition capacity. What’s more, the nitro speed booster will last longer when you upgrade it. In Dead Car Run, you have a limited amount of fuel. You will be a sitting duck for the zombies if your car runs out of gas on the road. To avoid this, you can save on fuel by releasing the gas pedal when driving downhill or during a jump. Watching video ads will help you earn free coins, vehicle upgrades, and fuel. This can also help you multiply your cash rewards. One free car will unlock as well if you watch a series of five short clips. The video ads will need an Internet connection in order to stream. So, make your phone is online in order to claim free items through ad watching. The machine gun equipped with every car is a powerful weapon. It not only destroys zombies but also blows up obstacles set up on the road. Obstacles slow down your car every time you hit them. So, shoot at roadblocks to maintain momentum. You can drive at crazy speeds by hitting the nitro boost. However, don’t get carried away with the thrill of fast driving. For the most part, simply use the gas pedal and save the nitro boost for tough uphill sections. Go to the search box in Bluestacks and type “Dead Car Run” without the quotes, of course. That is it! You can now enjoy your freshly installed copy of “Dead Car Run” on your favorite PC!